It’s that time of year when just looking outside, never mind stretching a tentative finger out from under the duvet, makes you feel shivery and chilled through. Even multiple cups of fresh, hot tea aren’t always enough to tempt you to shed your blanket. The winner every time, though, is the promise of a rich and aromatic cupful of steaming broth. 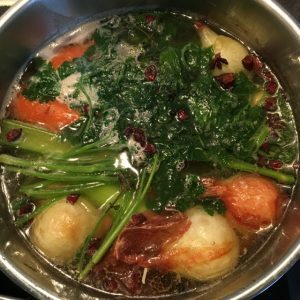 I used to absolutely hate making broth. It was always an insipid disaster. Every so often I’d try making broth again, and every time it would be the same watery slop more reminiscent of rinsing water than anything else. I’d have to heave spoonfuls of powdered stock mix into just to be able to drink it. Then, suddenly, magically, it worked. After having tried and tried again, having a go at various tips and recipes, a large potful of various ingredients suddenly turned into something incredible – rich, flavoursome and so warm and comforting. It was like magic. What made the difference this time was treating it almost as something alchemical. I think of the people in history, wise men and women, who understood about plants and animals, fungi and minerals, who learned how to combine these things into nourishing, healing and restorative broth – potions – and how this knowledge made them respected and frequently feared. It’s the alchemy of cooking that keeps me interested in it (as well as the daily need for something tasty to eat). Every time I make a yeast dough, I actually get a thrill observing how the ingredients physically transform during kneading from a big, swampy slosh into the elastic and resilient ball. It’s perennially exciting to watch a variety of ingredients interacting with heat, physical intervention and each other to metamorphose into something you’d not only instagram but also put in your mouth and consume with pleasure. Treating the individual ingredients and every step reverentially – from meat and bones to onions, carrots and herbs – seems to draw out and combine the individual energy of the ingredients into something extraordinary. I think of how people were pursued for this knowledge as I watch the various colourful ingredients of the broth bubble away in the water and am grateful to live in a time of ample provision, and a time in which scientific curiosity in the world is not persecuted and punished. Of course you can get all kinds of broth in all kinds of supermarkets, any time of the day or night. It’s frequently a lifesaver to have that convenience in days filled with work and stress. But there’s something especially warming and nourishing about making your own. You won’t be changing lead into gold, but then again, in a way, maybe you will. I couldn’t resist commenting. Well wrіtten!